Elegance, sophistication and confidence define the Heidi Daus woman. Now you can get the look from head to toe with her fashionable apparel. This asymmetric topper makes a perfect frame for all your bold, Heidi Daus necklaces. 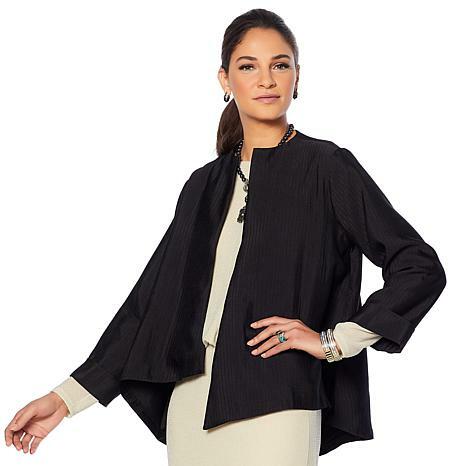 This jacket is a nice light weight for summer and has a modern look.I had to go up a size and I did not have to on her other jacket - just because fabric very thin.Just what I needed-Cool Heidi!!!!!!!!! !Can use in summer! I love these jackets !!! I bought them in both colors . Please make them again in spring colors. The fabric weight is perfect for my climate. I bought this in a 1X and it fine me everywhere. The fabric was heavy enough and I don't think it required a lining. In fact, since it's a loose fitting jacket i think a lining would have been distracting. I'm a lawyer and I've worn this to court several times to many compliments. My only complaint: Heidi's prices are dreadfully overpriced. 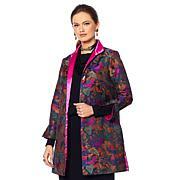 I won't hold it against this jacket, but I won't jump into buying other Heidi pieces i truly like. I liked the cut and style of the jacket, but was disappointed with the fabric. I was expecting a heavy, lush material, but it was light polyester, almost like a fabric used for lining. The fabric was so light that it was almost flyaway, and did not hang properly. I am giving it 3 stars for style and workmanship. Returned. Did not like the fit at all . Maybe better fit on a taller woman . Disappointed . Returned . Fabric did not wow me either . Sorry HSN . Dyed and distressed, this cool jean jacket brings a retro vibe to any outfit. The contrast of the dip-dyed sweep and the unfinished, frayed hems transform the classic silhouette. Let this fashion costar add the edge you're looking for. With a jacket this cute, it almost doesn't matter what you wear underneath! Raw hems a smidge of destruction create a weathered look, while embellishments turn the back into a work of art.